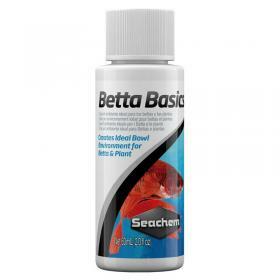 Betta Basics™ will remove chloramine and ammonia in addition to chlorine. It is specifically formulated for regular use in a closed system such as a betta bowl. It also provides an ideal environment for plants. Add 1 capful (4 mL) per each 1 L (1 quart*) of water. Use with each water change and for best results also use 2–3 times per week. In Betta-only bowls (i.e. no plant) use 1 capful per 4 L (1 gallon*) with water changes.